I got to spend time with a man whose life has been dedicated to bringing us the finest chocolate, at his delightful Paris creation Un Dimanche à Paris. Cat Black: You were raised in a family whose whole life is chocolate (Michel Cluizel is Pierre’s father). Were you always interested in chocolate, or did you consider it just your father’s work? Pierre Cluizel: No, I always loved it, and what I have said often is that when you are brought up in a world of champagne, wine, tea or chocolate I think there are two options. You could hate it, because it is there all the time and you have too much of it, or you fall in love with it. Me, I fell in love with it. I always loved that world. I think it would have been very bad for me to try to have a working life outside of the world of chocolate. CB: How did your own work with chocolate start? PC: When I was really small was just listening to talk about chocolate every day! My father brought chocolate home, so I began by tasting. Later, when I was six or seven I started by working in the atelier. Beautiful bars in the chocolate boutique. PC: Yes, my father took me, I would both work and rest. Once I was sixteen I would work there for some of the school holidays, learning about making chocolate. I had thought about working elsewhere for a time when I finished my studies, but it coincided with the death of my grandfather. My father told me that there were two options. I could work elsewhere, but he would need a Managing Director to help him, or my brother and I could start work straight away. We both chose to begin straightaway. My brother worked on the manufacturing side and I started work in the sales and marketing and client relations. CB: Did you have experience of all aspects of the business, were you able to learn them all? PC: Yes, but at that point my brother chose manufacture and I chose the commercial side. I also started up the export business. Now Michel Cluizel works with forty countries around the world. It was also my great pleasure to begin to source cocoa from many different growing countries and develop that side of things. Shelves of treats to choose from. CB: You told me when we discussed the gold medal won by Los Ancones in the International Chocolate Awards that you had a hand in its creation. PC: Yes I know and remember that very well. I was there, I know the Rizek family from that plantation very well. It is possibly the most beautiful plantation in the world! In any event I don’t know one more beautiful. It is next to San Francisco de Macoris. CB: Was it obvious that the cacao would make such a fine chocolate? PC: Actually there were two neighbouring plantations, we tasted them both. They were genuinely right next to one another, but they were large plantations and had slightly differing ‘terroirs’. We chose Los Ancones, the other is Esmereldas I think, which is also very good, but with a different character. Mendiants, a French classic, don't get better than these. CB: You began with your father, and working for the brand Michel Cluizel, what was the catalyst to begin to do something for yourself? PC: I had the idea a long time ago. I was working a lot business to business, with professionals, chocolatiers, patissiers and restaurants around the world. It was a superb business, but I had a desire to work more in contact with the consumer. When you create a bar of chocolate you think about how it will give pleasure to the consumer who eats it. I had an idea a long time ago to create a place for chocolate that didn’t exist, with an environment and activities all about chocolate. 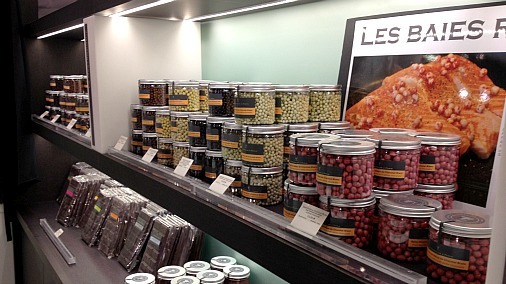 There are chocolatiers all around France and the world, but they are all shops, occasionally a little museum. But I wanted to do something more than that, and in Paris, something very Parisian. I also have dreamt for a long time of making a brand of my own, starting with a completely blank canvas, and building it up from scratch. Working for Michel Cluizel, for more than twenty years, there were things I wanted to do that I couldn’t, because they weren’t part of the strategy. So the decision was made three years ago, I left the business, which allows my brother to breathe too. CB: A business that size has its advantages, but it also has its limitations creatively. PC: I am someone very creative, and I needed to start from scratch. So I sold my shares to my brother and sisters and found this beautiful location. An open kitchen in the centre of the site allows you to watch the chocolatiers art. CB: Un Dimanche à Paris is quite lovely, in an utterly Parisian corner. It is truly special. PC: I set out to restore what I found here, and it is just how I like it. 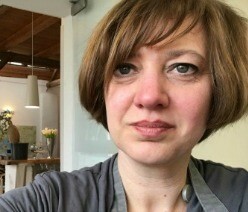 CB: I am aware of chocolatiers who have cafés or who also teach, but it is rare to find somewhere with a café, restaurant, bar, boutique and chocolate and patisserie school. PC: It doesn’t exist. For six months I researched this, and I have visited forty countries for work, but I have never seen it. 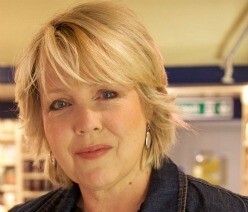 I have also talked to countless experts and food journalists and they all tell me that they have never seen this before. I really wanted to make something that didn’t yet exist, and it has given me great pleasure. CB: I need to ask if the couverture you use is all Michel Cluizel, or if you use others too? PC: Not at all! I started with chocolate from Michel Cluizel for the first month, but then, in order to avoid people thinking that the chocolaterie Michel Cluizel was opening a boutique I stopped using their chocolate at all. It was difficult for me as I know their products very well. CB: Yes and they are very good! You have also not used your name, Cluizel. Un Dimanche à Paris is a very good name, it evokes that moment of respite. 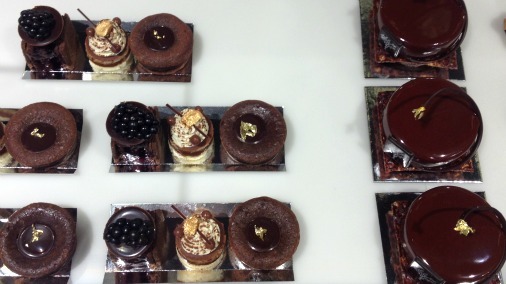 Stunning patisserie, they taste as good as they look. So do you work with multiple chocolate brands? PC: Yes. The couverture used depends on what product you are making. In the kitchen my philosophy is to work with single origin chocolate. Amongst single origin chocolates there are brands that make great chocolate, like Pacari, which makes wonderful things. There are other brands that sometimes make great things and sometimes not. So it is important to be free to use something that suits what you are making. CB: You grew up in the world of chocolate, how have you seen it change? PC: It has changed a lot, and I am talking about fine chocolate here. During the 70s there was really only blended chocolate, made up from many different source cacaos. In the beginning and towards the middle of the 80s we began to see single origin chocolate, that was new then. 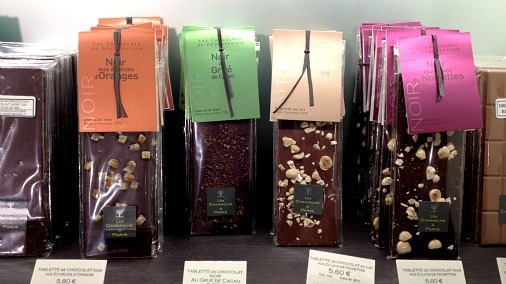 Next came the advent of chocolate from individual plantations, launched by companies like Michel Cluizel or Valrhona. That was a revolution, right at the beginning of the 90s. I remember also that at the beginning of the 90s the maximum percentage of cocoa solids we had at Michel Cluizel was 72%. I remember discussing it with my father and brother, it had taken ten years to get from 60%. I didn’t wish to progress two percent at a time, so I had the idea to go direct to the highest, 99%. I thought we would create a buzz. My father was happy to go ahead with 95%, but I wanted 99%. It was a big debate! In the end I got to choose and we went ahead! It was a great idea, and did create a big buzz. The following year, in 1991 we created the 85%. This was all a great evolution. Elegance, technical brilliance and the finest chocolate. CB: I find it hard to eat 100% chocolate because it is so dry in the mouth. PC: You should try 99% Noir Affini from Michel Cluizel. The thing about 100% cocoa mass chocolate is it must be worked, refined and conched. It isn’t that easy. CB: At the International Chocolate Awards we did taste 100% chocolate that was very refined, and really very good. But in all honesty, I get less pleasure out of a chocolate that has no sugar at all! PC: Yes I understand, I am with you. I also prefer something like, for example, the 85% Michel Cluizel, which is exceptional. We worked on it and worked on it and it is now superb, no one in the world makes a chocolate like that. Now what I find very interesting, working on my ‘Chocolats de Voyage’ is a balance of flavour and power, of identifying and noting the different flavour notes in the different origins. CB: I see you have them as wrapped squares with all the origins sold together as a set, for those who want to compare. Or as large bars, for when you have found something you feel is a favourite and want a whole bar of it! 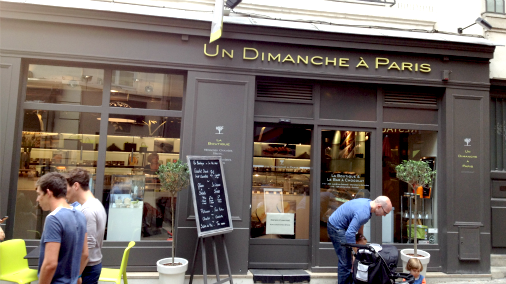 I love the design of your packaging, and of Un Dimanche à Paris café and shop too. It is simple but elegant, a great frame for the chocolate. And it isn’t brown! PC: I did say, when it came to the design, I am happy to use many ideas, but not brown. It is easier to reassure with the colour brown, it is classic for chocolate packaging, rather than to dare to use mouse-grey with lime green. But I love those colours! There are those who find them too modern, contemporary. Here we are in a corner of Paris that is receptive, and where I did what I wanted to do. I really knew what I wanted. But I also worked with a partner, my wife, who has great taste! 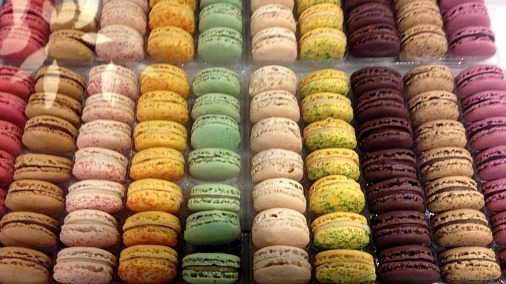 The macarons are pretty as a picture. CB: What do you think is going to happen next in the world of chocolate? PC: I still think that France is a world leader in terms of research and quality. I am talking of course of the world of bean to bar. Overseas there are certain very focused players, like Pacari for example, who do really great things. But there are a lot of people who want to work bean to bar, but who are using inadequate equipment (because the equipment is very expensive) and they are making something relatively crude. CB: Yes, I feel I have tasted a fair few. PC: I am not sure that that is a good development. What is interesting are those people like Pacari who are really working on their research and their technique and making wonderful things. That is a real evolution in the world of chocolate. They are really interested in the preservation of different cacao varieties, in different origins, and different ways to work with cacao. But there are very few of those. The greater proportion of the smaller makers are not able to make good chocolate. CB: Do you have other plans for Un Dimanche à Paris, other things you wish to do? PC: We have made a new brand, which we have made known and recognised quickly. I want to do everything differently to other brands that are already out there. It isn’t simply a boutique, not simply chocolates but also patisserie, also a restaurant to discover, or it is possible to work with chocolate on one of the courses. All that is already different to other brands. I want chocolate to be linked to the growers, but also really elegant and refined. We have made Un Dimanche à Paris here (the Cours Commerce St Andre, Paris), but I would also like to branch out. A little bit in Paris, but also overseas. 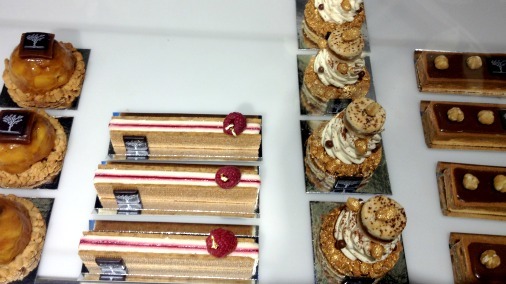 If you can't choose one patisserie, have this trio of three! PC: Maybe in London. Yes, I love London, I have an Uncle who lives in South Kensington, who is always asking me when I will come? Chocolate is more and more recognised there, which was not the case fifteen years ago. Now you find good chocolate, and creative people working in chocolate for a reasonable price. But in my head, at present, I am prioritising countries further afield, like Japan, China, the United States. CB: When you are doing something as interesting as you are doing here, it would be great to see it taken further afield too. PC: Something that I find interesting is to go to the edges of what chocolatiers habitually do. To make beautiful chocolate is special, and I have done much of that in the last 25 years. But what interests me also is to work with chocolate to make other things that go outside the norm; our coated spices, for example. CB: I love those. They are terrific! PC: Yes, they are great. 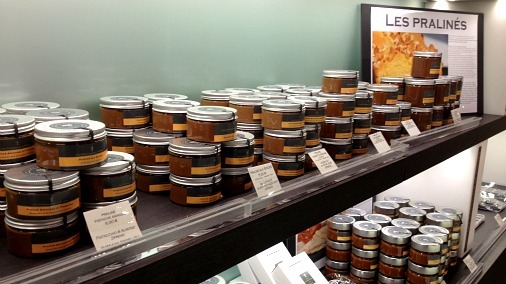 Jars of chocolate covered spices. CB: They are quite delicious, and a great idea, I have never seen that before. I have introduced my Indian mother to them, who loves them too. They remind us a little bit of supari, the Indian mixture of spices, some of them sugar coated, that you would eat at the end of a meal to clean and waken your palate. 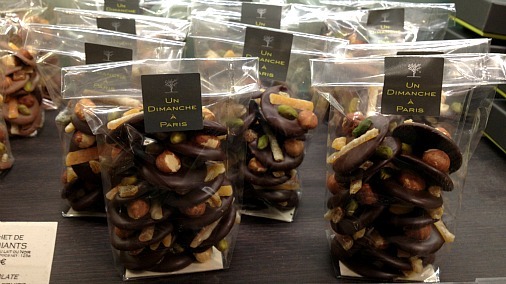 PC: I am also working on patisserie with peanuts and chocolate, which is not a combination you see in France. We have combined chocolate with raspberry and rose, which is quite marvellous. 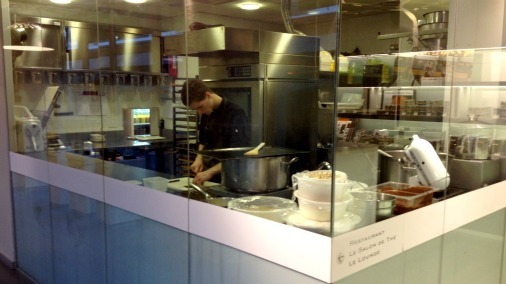 Here we also have our kitchen working for the restaurant. 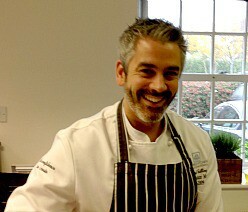 That aims to use chocolate in unusual ways, for all courses, to go with seafood, meat, cheese. We can use the beans in a vinaigrette, we do a millefeuille of white chocolate with Roquefort, which is exceptional. 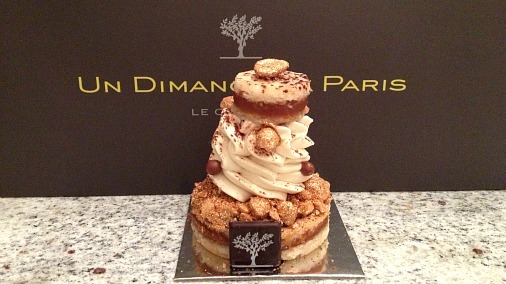 One of the newest creations, gloriously indulgent with caramelised peanuts. PC: What I love is really the idea of purity, and the idea of origin. So if I was to speak of one chocolate, it would be a pure origin chocolate. Something which had aromatic notes, and spoke of it’s terroir. 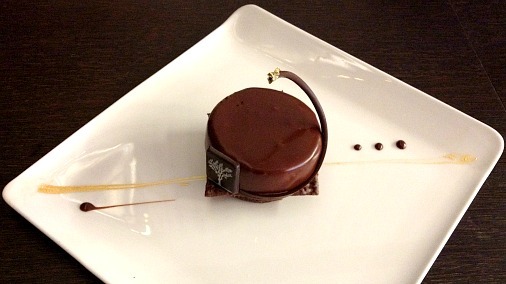 A thoroughbred chocolate (Pierre used the French word racé), with much character. If I need to give a favourite, I love Equadorian chocolate, Venezuelan too, but if I have to choose one then Equadorian. A dark chocolate, which is masculine, but floral notes which are very feminine, and also very original, I love things that are original. Equadorian chocolate is a marriage of all those things. Can I say one more thing, I find that chocolate is a world in which you can be very creative. Unlike in the world of perfume, wine or champagne. In the world of chocolate there is still room to create, even if you are small. So I have a great desire to tell a different story to all the other brands and chocolatiers.